Heads up, people! 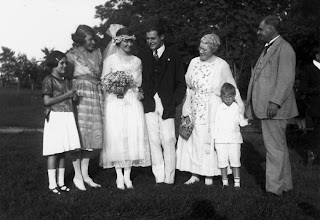 Let me proclaim my prejudice toward Hemingway before I begin talking about The Paris Wife. I never liked him. To be fair I have him mixed up in my mind with a person I do not like so it might not be all his fault. Still, I never liked the stuff I've read. (It's always possible that the next one might turn me into a slobbering fangirl. Possible but unlikely.) I always found his books to be a lot of 'look at my manly manliness' with the boxing and fishing and whatnot. I find it ironic that there are people who give female writers a hard time when they write about womanly pursuits but we're expected to marvel at a hundred pages of Joe Dimaggio gushing. But hey, that's another story. The Paris Wife, it seems, has not endeared me to the man. Right then. 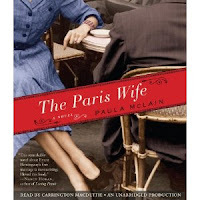 The Paris Wife by Paula McClain is the story of the marriage of Ernest and his first wife Hadley as seen through her eyes. Hadley marries Ernest after he sweeps her off her feet through his fine letter writing skills. They marry and as soon as they can head off to Paris to live the bohemian lifestyle. They struggle for many years but they always have each other, until Ernest finds success and things take a turn. I'm leaving out a lot because I didn't know much about either of these two and I found their story more compelling that way. I will say this upfront: Hadley did get a lot from this marriage. She had her son Bumby, the rights to The Sun Also Rises, and an exciting life full of interesting people. Seriously, if she hadn't met Ernest she'd have been stuck watching her sister mentally destroy her husband. Instead, she got to live in Paris and meet people like F. Scott and Zelda Fitzgerald. And she was happy when things were good but when things were bad, they were very bad. Ernest comes off as a very selfish man. He doesn't take into consideration Hadley's feelings about anything. What she wants doesn't even come second, it doesn't factor in at all. It's all "Me, me, me, and did I mention, me?" It's all about his career, all about his wants. When he isn't properly admired, he gets sulky. He's like a toddler. Hadley is always trying to sooth him, thinking of his needs. Her thinking is that his success is a reflection of her. Maybe, but he rarely shows his appreciation. She isn't alone in this type of thinking. There were women throughout the book who gave up so much or put up with numerous mistresses because the men were the Great Ar-tistes and heaven forbid you be seen as a Bore! That's the worst thing a woman could be. This next section might be a bit spoilery. Avert your eyes! When The Other Woman came on the scene, I was glad I was listening alone at home. I was so angry the house was filled with rantings much like the R-rated part of The King's Speech. When she confronts him, Ernest was angry that Hadley would bring up the subject. "Now everything is shot to hell!" he says. He wants them both. Now if she had been down with this from the beginning-fine, but she's sick about it. He doesn't care what she wants, again it's about what he wants. He also acts as if the affair is something out of his control which drove me crazy! You can look now. End of Spoiler. McClain occasionally veers away from Hadley and into the mind of Ernest. I suppose it was to pry some sympathy out of the reader for Ernest, but all I could see was how he rationalized his bad behaviour. Honestly, I don't think these digressions did much for the narrative anyway. This is Hadley's story. One of the things I enjoyed most about The Paris Wife was how vividly McClain painted the bohemian life the couple had. Sure they lived in holes, but it was nothing for them to pick up and go to Spain or Switzerland for months at a time. They ate, they drink, they laid out in the sun. What a life! The Paris Wife turned out to be an emotional story, well worth reading or in this case listening to. About the Audio: Carrington MacDuffie does an excellent job narrating. I'm not a fan of Hemingway either (and I loved your intro! ), but I'm very curious about this one. I'm glad to hear it was worth the read (or listen). Great review. I've heard wonderful things about this book and hope to read it soon. I agree, I could have done without those glimpses into Hemingway's mind, I thought we got a good enough picture of him through Hadley's point of view. And man, was he a jerk! I am not a huge Hemingway fan but I am dying to read this. Hopefully soon! I've never tried any of Hemingway's work, but love him or hate him, you can't deny he had an interesting life. This book sounds fascinating. I've read other reviews (including my friend Sue's guest post/review on SITFOB), that say much the same - THE PARIS WIFE lets us read Hadley's story (well, as imagined by the author). Your suggestion of listening to this one is a great idea -- that may be how I get to it! Nymeth- You definitely don't have to be a fan of his to enjoy the book. Swapna- I've heard a lot of good things from other bloggers too. Hope your experience is similar. Lola- Hope you like it! Kathy- It was definitely not boring being married to the guy. Dawn- I enjoyed listening to it, for sure. I love/hate Hemingway. The first book I read by him turned out to be his last and it was incomplete. Argh! The next book I liked. The next I couldn't get into -- actually couldn't figure out what the heck he was trying to say. Regardless, The Paris Wife sounds kind of fun. Great review! You sound like me about Steinbeck! I had the pleasure of hearing Paula McCain read sections of this book at the trade show last October. I enjoyed what I heard and am embarrassed I haven't gotten around to reading it yet myself. I'm really glad you were able to enjoy it in spite of your aversion to Hemingway!